Funko recently announced a new vinyl figure. 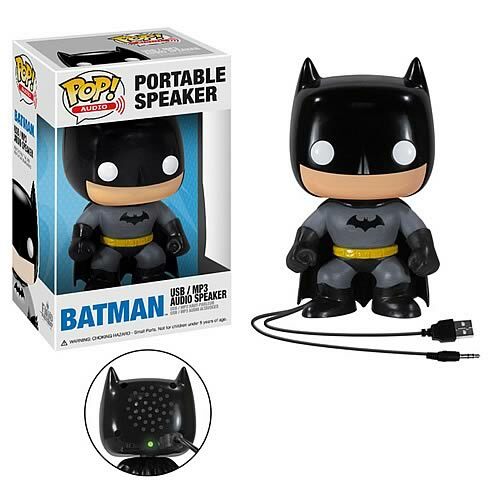 If you’re a faithful fan of Batman, you may like to enjoy your favorite songs via the POP! Audio Batman vinyl figure speaker.This is an interesting and practical POP! vinyl figure based on Batman, one of the most popular superheroes. As we can see from the images, the vinyl figure features adorable design, and similar with other Funko POP! figures, the Batman figure has a big bobble head, of course, those iconic details undoubtedly tell us the dark knight has been back, but not for seeking Bane. His mission is to bring you awesome music, so the Batman figure doubles as a portable speaker, using the integrated 3.5mm audio cable, you can connect it with your music player or smartphone for music playback. Apart from that, the USB cable lets you charge the Batman via USB or AC adapter.